From "History of the Diocese of Kentucky"
These records were printed in the Pendleton County Historical Society Newsletters. Note: We are so fortunate to have such a wonderful Historical Society! The Society generously provided this site all the past issues of the Newsletters. Please join and support this great society! The Society has my deepest gratitude, believe me, Pendleton County researchers are fortunate, not all Historical Societies are as generous! Early Catholicity in Pendleton County centered around Falmouth, Foster's Landing, Dividing Ridge, Stepstone and Butler. As early as 1851, Falmouth was assisted by missionary priests from Frankfort and Lexington. The report of the Diocese for 1857 states that Falmouth had a church, although not completed. Falmouth at that time was being attended every two months from Paris. The first church at Falmouth was begun under the direction of Reverend Herman Allen. On November 4, 1860, St. Francis Xavier Church, a brick structure, was dedicated by Bishop Carrell, assisted by Rev. Eberhand H. Brandts. On August 17, 1876, Rev. Ausustus Gadker began a pastorate at St. Francis Xavier Parish, which was to extend over the next nineteen years, until May 12. 1895. The congregation of Falmouth, under the guidence of Father Gadler, undertook to build a more worthy church. The new St. Francis Xavier Church, the brick structure which serves the parish today, was dedicated on Sunday, September 12, 1880. The early congregation at Falmouth was predominantly Irish. May Irish Catholics had taken up residence at Falmouth, while engaged in work on the railroad; others had settled on farms. Thus it was that when Bishop Toebbe, in 1883, forbade the St. Patrick Benevolent Society of Falmouth to attend divine services on the Feast of St. Patrick in full regalia; the Irish of Falmouth were disturbed. Not giving any reason for his action, they put their own interpretation on the Prelate's motive. They felt themselves deprived of the privilege of celebrating Ireland's great Patron feast in accordance with time-honored custom. They ventured to surmise that the Bishop's action was an anti-Irish policy, and was an attempt on the part of the saintly Bishop to Germanize Irish Catholic congregations. In 1916, during the pastorate of Rev. 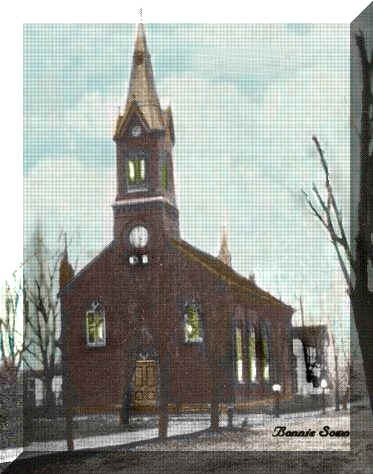 Martin R. Delaney (1911-1917), extensive renovations were made on the parish church. When Rev. Declan Carrol left St. Francis Xavier Parish on September 26. 1918, to become an Army Chaplain, during World War I, Rev. Joseph M. Lelen, at that time pastor of St. Paul Parish, Florence, was appointed as his successor. Father Lelen has held the pastorate of Falmouth for the past thirty five years. On September 19, 1948, he observed the Golden Jubliee of his ordination t the Priesthood. Father Lelen is a widely known author and literary critic. He is the personal friend of many famous authors in America and Europe. He is the author of a number of books, including Towards The Alter, written in 1908; Towards The Sanctuary, in 1908; The Agony of Our Lord, in 1920; The Gospel of a Country Pastor, in 1922; Mysterium Amoris, in 1935; Towards the Eternal Priesthood, in 1939; and My Key to Heaven in 1950. From 1912 to 1915, he served as Editor of the diocesan paper, The Christian Year. He likewise contributed to a number of magazines and newspapers, including Emmanuel, The Priest, The Messenger, and the Falmouth Outlook, local weekly in Falmouth. 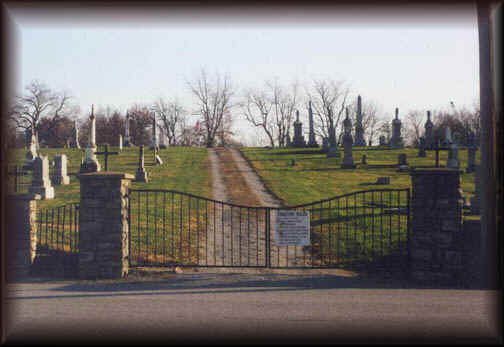 The parish at present has a congregation consisting of about seventy-five families. Photo generously contributed by Sue Bayes, thanks Sue! Mr. Nagle's note: "The records in early 1876 and 1877 are very faint and hard to read. Some have been omitted until closer examination of the records can be made. Bonnie's Note: Please use your own imagination to determine the correct spelling of many of the following names. Mr. Nagle transcribed them as they were written but we know how creative our ancestor's spelling could be!